New version of SBA test rig based in servo-electric actuators. The system includes a reliable real time controller with specific improved algorithms and control strategies for ECE R14 and similar type profiles. 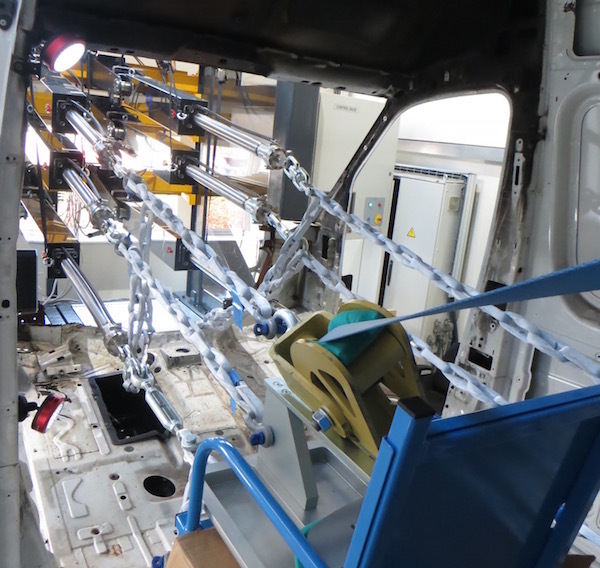 ADDITIUM has introduced for first time the use of ULTRA LIGHT high resistance chains (Tycan®) that will improve your Seat Belt Anchorage Test Rig operation and test set up. The chains are 100% made of Dyneema highest resistance fibre, providing a lot of advantages replacing traditional steel chains. The heavy-duty system is a cost-efficient solution, capable of testing up to 3 seats simultaneously and independently. The Roof Crush and Side Intrusion Test System is a combined test bench designed to evaluate the roof and side strength applying a controlled load over them. This quasi-static test system could be equipped with electrical or hydraulic actuator.